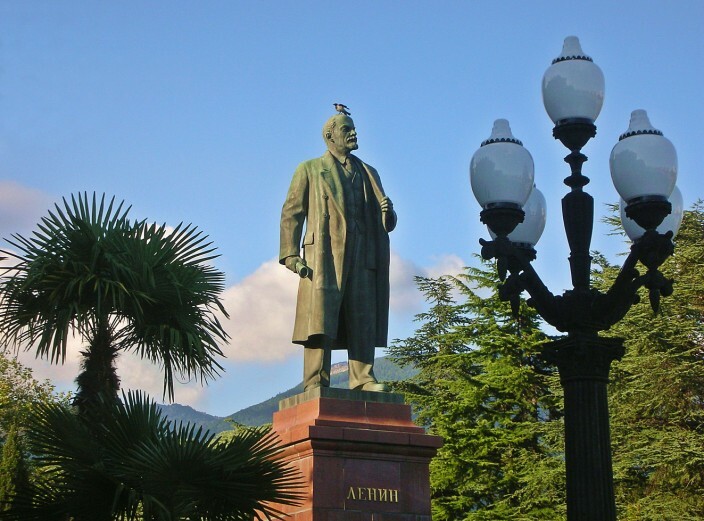 Yalta is a city of about 100,000 people perched in a spectacular natural setting at the southern tip of Crimea, nestled beside a deep bay on the Black Sea and surrounded by high cliffs that plunge almost right to the waters edge. This is the main reason the rail line doesn’t run all the way to Yalta. It simply wouldn’t be feasible, economically or physically, to build one. If you travel from Simferopol to Yalta like we do, by taxi bus or electric trolley, be prepared when you step off the bus for what I call the assault of the room-for-rent-vultures. These are women scouting for travelers seeking non-hotel accomodations in town and if you show one of them the slightest interest, the entire pack will descend upon you and pick your bones clean within minutes. Okay, I exaggerate, but only a little. It’s really quite comical to watch them surround their victims and make their pitch. This is high-pressure salesmanship of a magnitude I’ve never before witnessed. Half the time I expect to see hair pulled and punches thrown as they argue and try to outmaneuver one another to gain the interest and attention of potential renters. Of course, I don’t understand a word they’re saying so I can afford to laugh. My wife, however, has to sift through the offers and counter offers, decide who might have the best deal, where the room is located, the cost per day, etc. And like a good salesman anywhere the vultures will always try to upsell you. Case in point, our most recent visit. After stating that we were looking for a room at 250 hryvnas a day, about forty dollars, my wife fielded several offers. “With a kitchen, and private bathroom,” Irina added. We followed her across the road from the bus station and boarded a city bus to the waterfront area. All the while I was schlepping around a forty pound backpack and fifty pound suitcase, the bus was stifling, and I was already exhausted and sleep deprived from the all night train ride. We got off the bus and started walking. Actually, jogging would be a better term. For some reason we seemed to be in an ungodly hurry to get to this place, so I was huffing down the uneven narrow sidewalk with my backpack cutting off the circulation to both my arms while the suitcase careened wildly on its rollers behind me like a runaway semi with no brakes and women and children fled the sidewalk at our approach. I had no choice but to try and keep up, hoping not to lose sight of the vulture, my wife, and stepson as they sped on ahead of me in what rapidly turned into the Yalta five thousand meter dash. Maybe we were trying out for the Tourist Olympics team and they forgot to tell me. We finally arrived and the vulture showed us the room. It was a nice suite, but immediately we noticed there was no kitchen and no bathroom. She did finally – albeit reluctantly – show us a cheaper room nearby, at three-hundred fifty a day, but still no private bath or kitchen. After ten minutes of being held hostage – she literally had us locked inside the apartment for a time – and another ten minutes of arguing, yelling, arm-twisting and increasingly agitated exchanges, we parted ways acrimoniously, to say the least. All these negotiations were conducted in Russian, of course, and it’s probably a good thing I couldn’t join in the conversation as my contribution would have been along the lines of “Tell this bleep to take her room and shove it,” which wouldn’t have helped anything except to make me feel good that I could stand there and insult the vulture without her understanding a word of it. In the end we returned to where we’d started and rented a great room from the same man we’d rented from a couple years earlier, and yes, in retrospect we should have done that to begin with. This room had a private bath, shared kitchen facility and came at the price we wanted all along. The lesson? Be firm on your price and what you want and be prepared to walk away from the deal if the vulture won’t budge on the amount or show you a cheaper option. Certainly we could avoid all this by taking a hotel room but as in all tourist towns – and Yalta is definitely that – hotels can be exorbitantly overpriced. For the budget-minded traveler (that’s us) who intends to stay a few days (again, us) it can save you a bundle to find a room the way we do, and the reason we do this is simple: there is so much to see and do in and around Yalta that we spend very little time in our room. As long as it provides a decent place to sleep and clean up, we would rather save our money and spend our time squeezing as much as we possibly can into our alloted time there. Our belief is if we leave town and are not exhausted, we haven’t done it right. This approach doesn’t suit everyone, obviously, but it’s how we like to travel. Not for us laying on a beach for a week drinking ourselves into oblivion, or lounging on cruise ships seeing how many pounds we can gain in one week while gorging ourselves on the all day and night buffet. The rooms we rented were located about a mile from the waterfront and for a good portion of that distance the sidewalks are lined with street vendors hawking their wares, selling everything from flowers to produce straight out of the field to fresh baked breads and pastries. 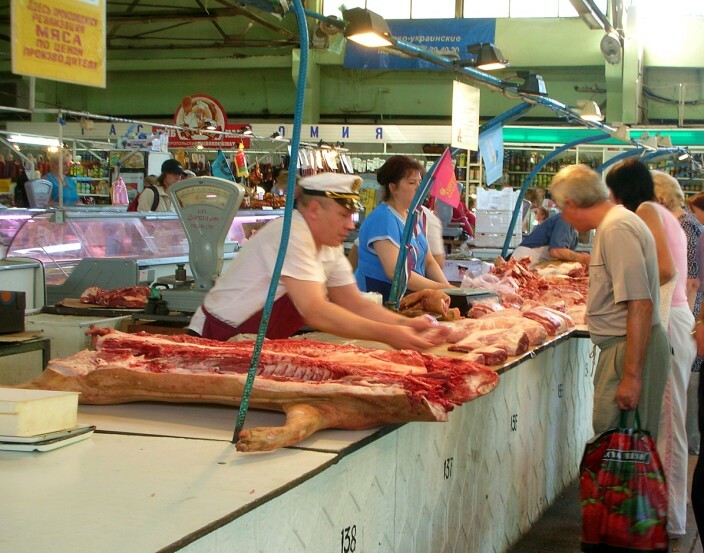 You can also stop in the meat market and have your own choice of cuts chopped off the carcass while you watch, or wander through the huge, covered produce market where sellers will crush fresh pomegranate juice for you, tasty and very cheap compared to U.S. prices. These sellers, much like the room-for-rent vultures, can seem aggressive by American standards, but not at all in an unfriendly way. 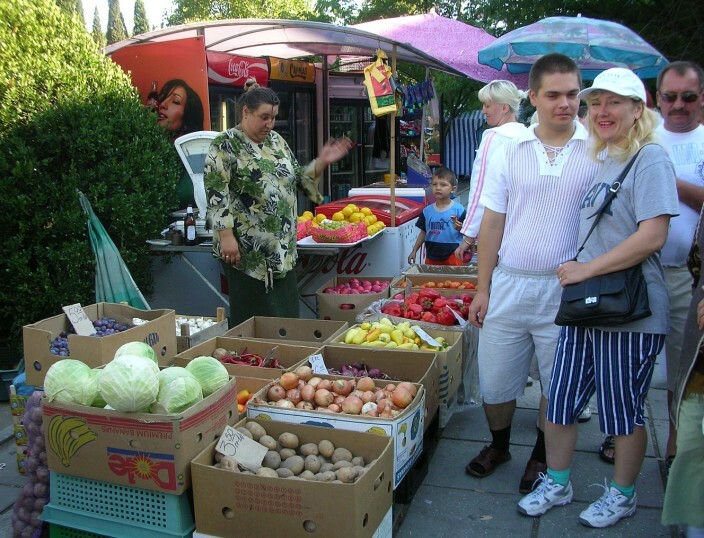 They simply know the competition is fierce – you can find scores of other vendors all selling the same cornucopia of garden fresh stuff – so just realize that as you walk by they might brandish their wares at you while telling you what a bargain it is, and if you should linger or make eye contact they will assume you want to buy. You can sometimes haggle a bit and they might drop their price a hryvna or two, but we’re only talking a quarter or so in American money, so haggling is not necessary but rather more for the fun of it (if you enjoy that sort of thing) than any major savings. 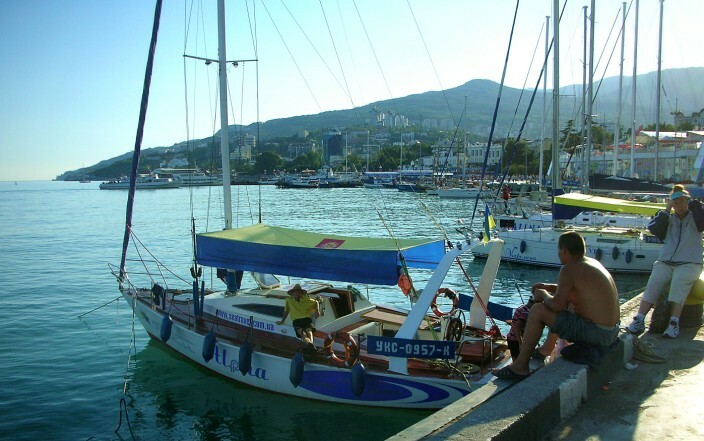 Yalta is a very touristy city in many respects, the waterfront promenade is kitschy, the traffic can be horrendous, the heat oppressive in midsummer, but it’s still a charming town full of an infectious energy. For us it’s a joy to wake up and anticipate the new day and wonder what sort of adventures await us. 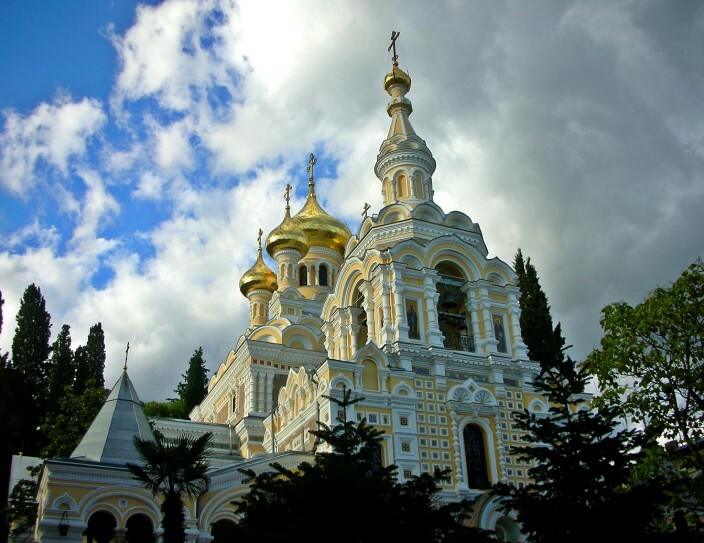 Yalta is also a great central location from which to explore the entire southern coast of Crimea, and the locus of a booming excursion business. You can find day trips to anywhere in the region at reasonable rates, approximately fifteen to twenty-five dollars per person depending on the destination and length of trip. We generally decide where we want to go the day before, pay for it, then show up at a designated meeting point next morning and wait for the driver to arrive. Most of these excursions are done in groups of ten to twenty people. Some are all day affairs of eight to twelve hours, others more in the four to six hour range. The price includes round-trip transportation and Russian speaking tour guide. If you want an English speaking guide, that’s going to cost you extra and is not available on every excursion. Mention the name Yalta to most Americans and if they identify the name at all it’s usually in connection with the famous Yalta Conference of 1945, when Stalin hosted Winston Churchill and Franklin D. Roosevelt at the Livadia Palace for talks just prior to the end of World War II. Basically the big three Allied leaders were there to decide the postwar fate of Europe, and though they didn’t know it at the time their decisions to divvy up east and west would have lasting repercussions and lead directly to the Cold War of the next several decades. I’ll have more to say about this slice of history in a later section about the Palaces of Crimea. But long before Churchill, F.D.R., and Uncle Joe sat down to discuss who got what, Yalta and the southern coast of Crimea had been a popular holiday destination, the Riviera of eastern Europe. In the days of Imperial Russia, the czars and nobles all had their summer homes in the region. Let’s face it, if you’re living in a frozen land like Russia where you’re locked in bitter winter for six months of the year, a place with the climate of Crimea looks pretty appealing, not to mention the importance of a warm water seaport for what is otherwise a gigantic land-locked country. This latter aspect alone has been the most compelling reason why Russia has always coveted Crimea, and still does today. The aforementioned Livadia Palace was the sometime residence of the Romanov’s, Czar Nicholas II and Alexandra, before the Revolution and the Bolsheviks deprived them of it – and their lives. 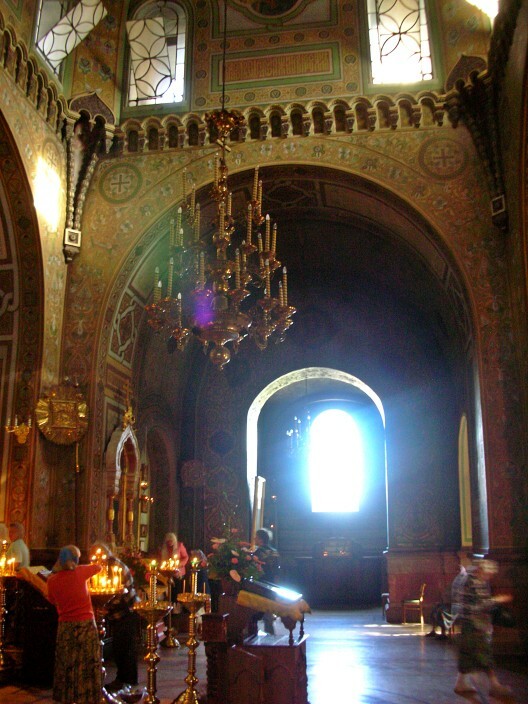 And while the Commies laid waste to many of the Soviet Union’s old churches, monasteries and cathedrals, even they weren’t stupid enough to destroy these grand monuments to lavish living, instead appropriating the palaces for themselves and their own families and cronies to enjoy. No laboring in the collective fields for those swine, er, comrades I mean. The Soviets did build several sanatori – what we would call health spas – in the area for the use and benefit of the proletariat, but with the end of the Soviet era came an end to the yearly government subsidies for the vast majority of workers to travel to and enjoy these sanatori. Many of these facilities have now closed or tried to refashion themselves into paying resort destinations with varying levels of success. 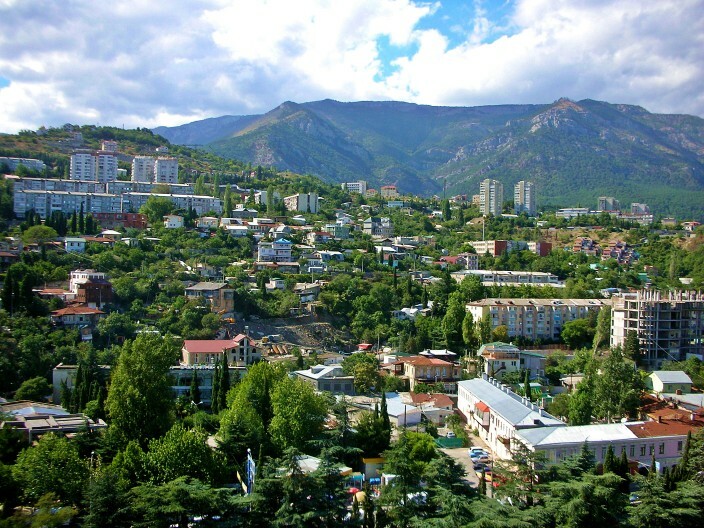 In the Soviet Union, with travel forbidden to other countries, Crimea and the Yalta area were just about the only game in town for anyone with the means or desire to spend some time in such a resort type atmosphere. 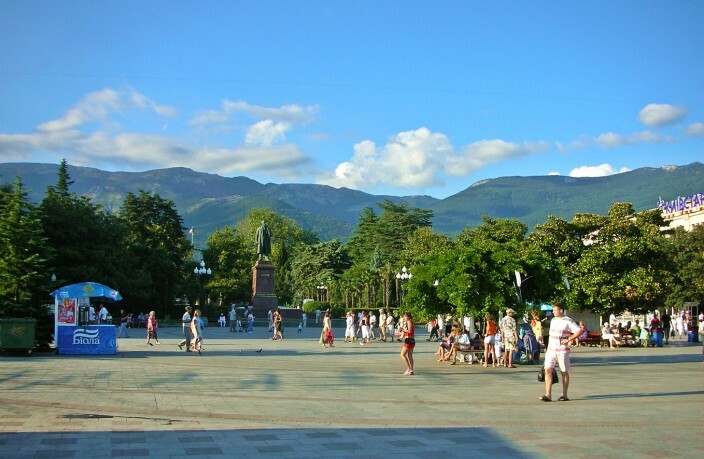 Now, those who can afford to, go to other spots around Europe and the world, leaving Yalta struggling to maintain its position as a vacation destination, both with the locals and foreigners. 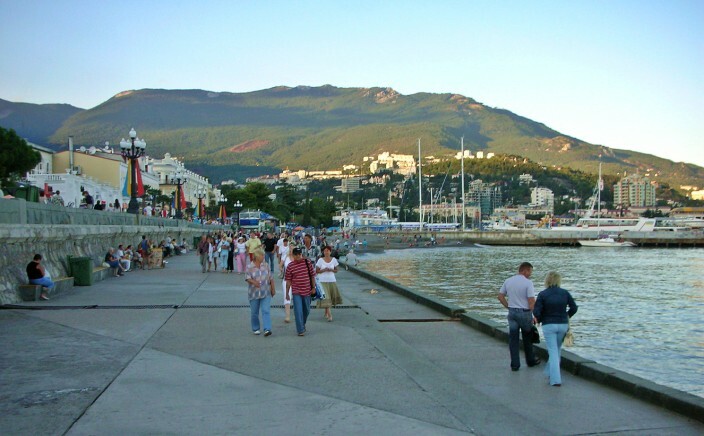 Today, less than ten percent of the tourists wandering the hills and shores of the Yalta region are from outside Ukraine and Russia.